The PolyHouse project was founded in 2004 by Dr. Roya Javadpour as part of a Project Management course she developed in the Industrial and Manufacturing Engineering Department at California Polytechnic State University in San Luis Obispo, California. The PolyHouse project, takes place each spring with the introduction of a community service house remodel project limited to six weeks of planning and two weekends of execution for a physically disabled financially disadvantaged family or individual. The mission is to improve the quality of their lives. The remodel is restricted by a budget (to be fundraised), tool and equipment resources (to be donated or borrowed), and human resources (limited to the students and any volunteers they can recruit). Through this project, students engage in scheduling, supply management, project team recruiting, resource allocation, time/cost tradeoffs, risk assessment, task coordination, team-building, progress monitoring, and post project assessment. The students plan and manage their progress using appropriate project management tools and techniques. Additionally students contribute their own physical labor to the project. As a result of participation in this project students witness the impact they can have on society. It helps students understand the qualities of success and the importance of showing initiative and integrity. Equally important is the rare personal satisfaction that comes from helping others. Finally they learn the value of a committed team and gain confidence to lead, take risks and the courage to dream, realizing that nothing worthwhile comes easily. 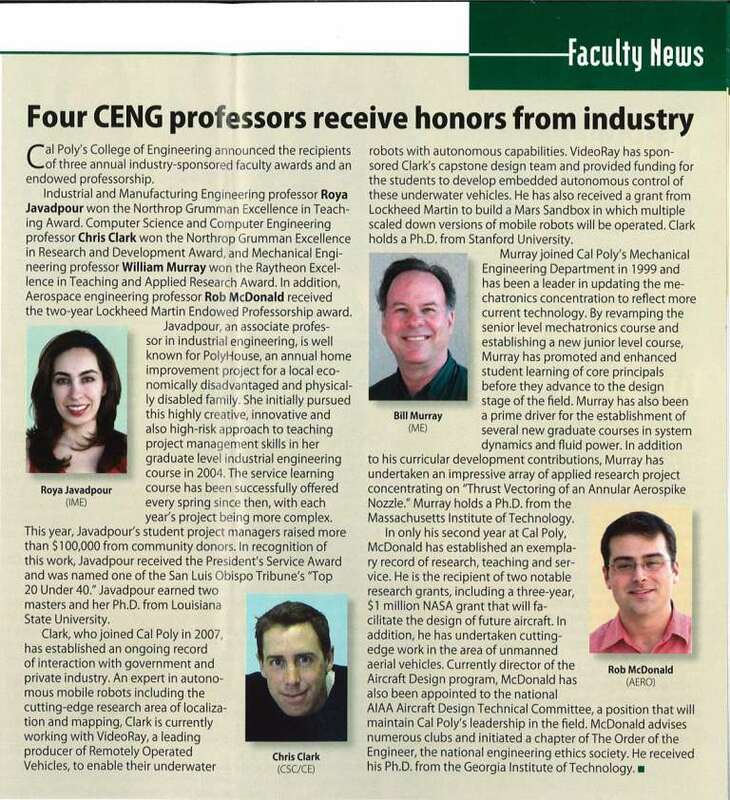 Dr. Roya Javadpour was recognized as runner up for the International Innovation in Curriculum Award sponsored by the IIE Council of Industrial Engineering Academic Department Heads in 2008. Her other recent awards include: Northrop Grumman Excellence in Teaching Award, Cal Poly President’s Innovation in Service Award, Paul Wolff Accessibility Advocacy Award and was named one of the San Luis Obispo Tribune’s “Top 20 Under 40” in recognition of her professional excellence in her field and commitment to the community.